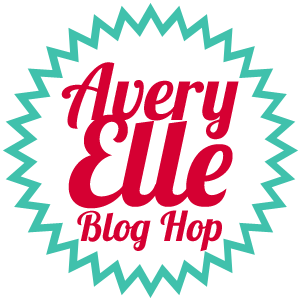 Last month Avery Elle went to a bimonthly release, but that doesn't mean we can't hop this month! Today I'm hopping with the set Oh Happy Day! As I'm sure you've noticed, I cannot put this set down. The font is just so unique and seems to go with practically any style. So I paired the Oh Happy Day sentiment with an older Avery Elle set, Blooming Banner. To make this design, I stamped the largest image from the Blooming Banner set 4 times on to a piece of scrap white card stock. Then I used a Rounded Diamond die to cut just the middle of the design. I colored the design with Copics and arranged them together on the card front with a bit of foam tape. I love how it came out modern and folk arty all at the same time! 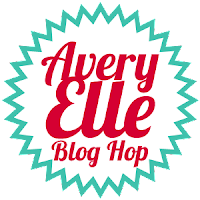 To celebrate the Release Blog Hop, Avery Elle is giving away a $25 Gift Certificate to one winner! You have until Sunday, July 8th midnight EST to enter. The winner will be announced on the Avery Elle blog on Monday, July 9th. All products are available for purchase in the Avery Elle store right NOW!!! Great card! Love the simplicity. Wow!!!! This card ROCKS, dearie!!! WOW! What a clever design, JJ! I love how you created the graphic pattern and the color combo is amazing!!! Yep, trendy and folksy at the same time.....and freakin' awesome!! So unique and I love the colours! Love this look! The graphics are fabulous! Beautiful! Love the design and love those colors!! Seriously JJ could this be any cuter? I LOVE it! Love the pattern play on the die cut! WOW! Absolutely stunning! I really love what you've done here...great design and great colors. Oh my!!! Your card is absolutely amazing and the colors are just beautiful. Thanks so much for sharing...WOW!!! I love the card. The colors are so bright and vibrant. The four "squares" fit together so good to make a continuing design. Thanks for sharing. This font is awesome...loved seeing it paired with an older set. Such a bold, stunning card. love how you completely transformed the look of the stamp! I Love this card! It's the perfect mix of bold but simple. LOVE this! 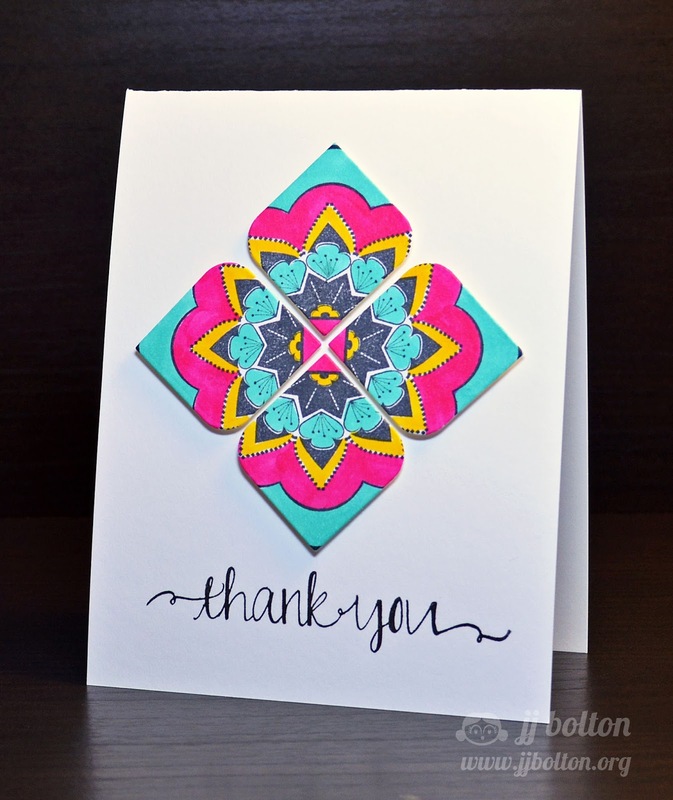 Gorgeous combination of stamp/die and love the colors! This made me gasp a little! Love the colors and bold bold shapes! This card is gorgeous! The vibrant colors are perfect with the image stamped, and I love this die, so elegant! Fantastic card! I love the way you pieced the design together and the bold colours. I love how that mandala fits on the die cuts and my eye fills in the rest of the pattern too!! Holy cow...your stamping is gorgeous. Using the rounded square is brilliant. How clever and striking. The color choice is so perfect. Love the bright colors. Thanks for sharing. These colors are AMAZING, JJ! WOW! wow!!! crazy!!!!!!!!! this is just amazing!! i'm stunned!! such amazing colors and so innovative!! beautiful card! It's a kaleidoscope!!! How creative!!! Gorgeous card. I love those fantastic fonts in Oh Happy Day. This is gorgeous, JJ! Love the fabulous tile effect and the bright colours. And that font really is cool. It's high on my wish list. :) Hope all is well with you! Big hugs! What a great card--you made it look like hand painted tiles . . . I love these sentiments, too, and how you mixed the stamp with the die cuts! Super cool! Thanks so much for sharing!!! Great card! I love the colors you chose. I am in love with the sentiment font! Thanks for sharing! The design is so intricate and gorgeous, JJ! You really showcase the die AND the stamp so fabulously! Beautiful colours and so stylish! Thanks. WOW! This is amazing! What a fabulous design you have created! AMAZING and what a creative idea - love all the bright colors!